Features Fixed, Two Column, Brown, Left Sidebar, Animals. 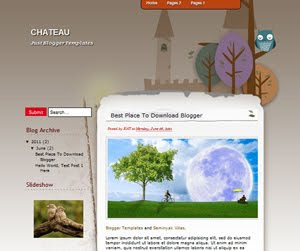 Descriptions Chateau is free blogger templates with categories bird themes, very simple blogger templates with brown and white gradien as main background and ghost bird on header make it very cute and unique. This blogger templates very good for personal blog.